Civitas: Institute for the Study of Civil Society Where’s the Insider Advantage? Britain’s relationship with the European Union is under scrutiny like never before. Increasingly passionate arguments are being mounted on both sides of the debate, but they have been generating more heat than light. 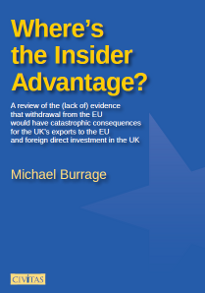 In an attempt to furnish the argument with the facts, independent analyst Michael Burrage here provides a sober and detailed study of the supposed trade and investment advantages that EU membership entails. Using official data spanning several decades of recent economic history, Burrage looks in turn at the performance of British exports, and then at the extent of inward investment to the UK, in the light of EU membership. His findings provide a bracing rejoinder to the constant refrain that British exports and investment rely heavily on the Single Market. Divided into two discrete sections, the book first considers five decades of OECD figures in an attempt to discern the trade advantage to Britain of being a member of the EU. Burrage finds, however, that the UK’s trade with other EU nations accounts for no more of its trade with all leading economies now than it did on joining the European Economic Community in 1973. Meanwhile, exports to non-EU nations Iceland, Norway and Switzerland have increased enormously over the same period. “While the share of UK exports to fellow EU members has been virtually stable, the share going to non-members in Europe has risen steadily, leading one to suspect that both insider advantages and outsider disadvantages are imaginary,” Burrage writes. “Thus far, the Single Market has not enabled UK exports of goods or services to other members to grow at a faster rate than those of non-member exporters, nor at a faster rate than UK exports to non-member markets. In the second half, Burrage turns to FDI since 1970 and a similar theme emerges. He finds that entry to the Common Market in 1973 did have a beneficial effect on FDI in the UK, but there is no evidence that it lasted for more than a decade. In fact, the UK’s per capita FDI stock has grown at a comparatively mediocre rate since the Single Market was founded in 1993. That of non-members in Europe has increased much more quickly, undermining claims that the Single Market has been a magnet for FDI. “The case for UK membership of the EU, of the euro, and of the Single Market, has rested to a considerable extent on claims about their benefits for FDI in the UK, and warnings about the consequences of losing them,” Burrage writes. “Much the most credible of these claims is that entry to the Common Market in 1973 boosted FDI in the UK, since the same positive effect can be observed in most other new entrants, whatever date they might have joined. Michael Burrage is a sociologist by training, was a Fulbright scholar at the University of Pennsylvania, and lectured at the London School of Economics for many years, specialising in cross-national analysis of industrial enterprise and professional institutions. He has had spells as a research fellow at Harvard, at the Swedish Collegium of Advanced Study, Uppsala, at the Free University of Berlin and at the Center for Higher Education Studies and the Institute of Government of the University of California Berkeley. He has been British Council lecturer at the University of Pernambuco, Recife, Brazil, and also a visiting professor at Kyoto, Hokkaido, Kansai and Hosei universities in Japan. He has written articles in a number of American, European and Japanese sociological journals, conducted a comparative study of telephone usage in Tokyo, Manhattan, Paris and London for NTT, and a study of British entrepreneurs for Ernst & Young. His recent publications include Revolution and the Making of the Contemporary Legal Profession: England, France and the United States (OUP, 2006) and Class Formation, Civil Society and the State: A comparative analysis of Russia, France,the United States and England (Palgrave Macmillan, 2008).